Over a dozen new furry faces surprised a Morris, Ill., family as their dog unexpectedly gave birth to 16 puppies earlier this week. MORRIS, Ill. (WLS) -- Over a dozen new furry faces surprised a Morris, Ill., family as their dog unexpectedly gave birth to 16 puppies earlier this week. 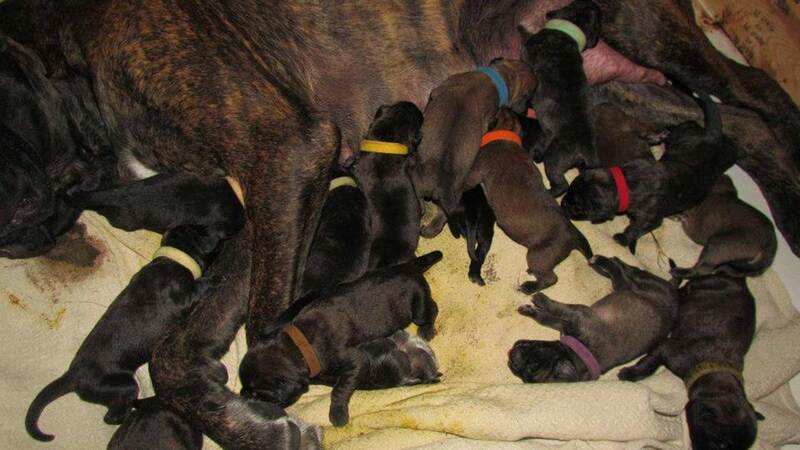 Booner, the family's 3-year-old English Mastiff, gave birth to the puppies Monday. Brandy Techmanski, the dog's owner, said Booner went into labor at 4 a.m. and gave birth to the last puppy at 11 p.m. that night. Techmanski says she, her husband and two daughters have been taking shifts to care for the pups while Booner rests. A veterinarian told the family that Booner and all 16 puppies - seven girls and nine boys - are healthy. The family says it expected a litter of six or eight puppies; although it's Booner's first litter, they say it will likely be her last.